Animated films have been getting the ol’ live-action treatment quite frequently as of late—there are even competing Beauty And The Beast and The Little Mermaid projects out there. Disney is, of course, behind one of each, and is preparing the world for Emma Watson’s take on everyone’s favorite bookworm. Meanwhile, Universal lost its Little Mermaid director just as it cast Chloë Grace Moretz as its Ariel. Now Sony Pictures is trying to join in on the fun with a live-action Mulan movie, Variety reports. The publication describes the project as a reboot, but the legend of Hua Mulan can probably be adapted or dramatized by Sony without technically contributing to the remake trend. There aren’t many details available, but the film will shoot in China, where Matt Damon recently battled dragons. 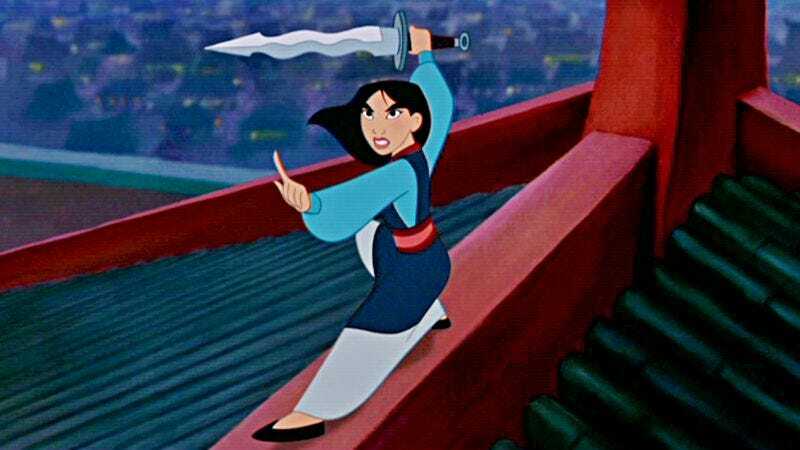 It’s been almost 20 years since Disney’s animated retelling of the story achieved critical and commercial success; that film boasted a voice cast that included Ming-Na Wen, B.D. Wong, and Eddie Murphy. The House Of Mouse announced last year that it’s mulling over its own live-action production of the story, so perhaps the next big trend in movies will be dueling versions of every property. The proposed film is one of several projects that Sony is developing with its own former executive Doug Belgrad, who’s co-financing the Mulan movie as well as Bad Boys 3 (otherwise known as Bad Boys For Life). Belgrad and Sony are also partnering up for a live-action Peter Rabbit movie starring James Corden and Rose Byrne, as well as the Charlie’s Angels reboot that Elizabeth Banks is reportedly directing.